Founded in 1954, The New London Historical Society (NLHS) has been supported by the effort of countless volunteers over the past 63 years. The success of our organization is due to the support of many talented and dedicated people. We are always pleased to welcome new volunteers--year-round! We are thrilled that some volunteers are able to give a weekly commitment--but we appreciate all help, even if you don't have lots of time to share. The range of tasks and responsibilities is quite comprehensive, and we are sure to have an interesting position for all ages and aptitudes. You can choose from working behind the scenes with the Village maintenance crew, to greeting guests who visit the Village. Or, perhaps you would like to lead a group of children in games or crafts. It could even be that an office environment calls to your particular skill set. In any case, we welcome any and all gifts of time and resources. When you volunteer at NLHS you can expect to have a great sense of appreciation for supporting the mission of the organization, learning interesting facts about local history, and becoming acquainted with the NLHS collections. As a bonus, you meet wonderful people from your community and afar, and you enjoy the rewards of accomplishment. Oh, and by the way, we also have a lot of FUN! Docents Sue and Linda enjoy hearthside cooking during our holiday open house, 2017. 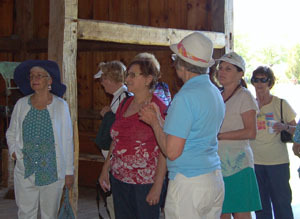 Linda Jaggard, coordinator for the Village Guides and Docents (in blue), gives a tour of Griffin Barn. Give us a call, email, or stop in to learn more about the wide range of opportunities. Phone: 603-526-6564, email: info@newlondonhistoricalsociety.org. The Administration Office is at 73 County Road in New London.